It might be the second month of 2013 but yes, our FADED GLAMOUR 2012 retrospective still rumbles on. 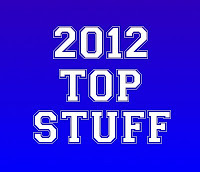 This time it's my top ten albums of 2012 featuring a double appearance of Ben Chasny, and several appearances of great music. Ben Chasny of Six Organs of Admittance in the company of guitarist Sir Richard Bishop and drummer Chris Corsano in a power trio named after a Javanese demon queen. She’s obviously immune to sophomore blues. Veterans who never put a foot wrong and have confounded expectation by following 2009’s 'Axe To Fall' with something even better. Intensity is what they do and there’s nobody does it better. The aforementioned Ben Chasny is clearly super busy but here makes time to rock out with his bandmates from Comets on Fire to devastating effect. I realised how much I miss them, and they prove they remain the tightest unit imaginable. Revitalised by new guitarist Andrew Elstner, Torche recovered their mojo and made a great album that seems even better than when we reviewed it. The titans of post rock unleash a welcome new album. They’ve been a massive influence on the genre since before it was post anything, and they still have energy and enthusiasm in spades. Recent live show proves that. Try: 'We All Rage In Gold', 'Bleeding The Pigs', 'Raise The Dawn'. London band stick to their guns and get better and better. New vocal style wasn’t to everyone’s taste but this is as accomplished an album as you could wish for. Peerless heavy metal meets uneasy dreamscape. Outstanding album from a band that has experienced a mighty rebirth through misfortune. Powerful stuff. Try: 'Swerve City', 'Leathers', 'Graphic Nature'. Chatham band with a simply massive presence and a magnificent sound. This is more invigorating than a day on Camber Sands. Music for life. From out of nowhere this record crept up on me and knocked me out. It’s utterly unique and laced with enough evil hooks to scare the devil. Northern Soul meets The Clash in a mighty mashup. This may not be the obvious choice but no album has given me more pleasure this year. The tale of a stowaway, shipwrecked mariner ending up on a mythic coral island and encountering a misleadingly beautiful siren and a hat-wearing dog before the whole place is obliterated in a volcanic eruption is quite simply in a class of its own. Utterly British and impeccably eccentric. Hooray!